One of my favorite things to do is meet new, local food producers who have great passion for what they do. I love hearing their stories about their journeys to where they are now. 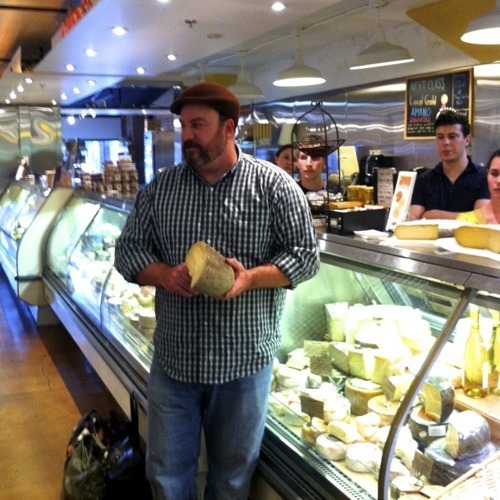 Thanks to a meet and greet held at Caputo’s market, I was able to meet cheesemaker Kendall Russell, from Lark’s Meadow Farms. Lark’s Meadow, based out of Rexburg, Idaho, creates delicious farmstead cheeses, meaning that it owns the entire production, from the cow to final product. While many cheesemakers truck their milk in from other dairies, Lark’s Meadow is able to maintain complete control over their raw product: milk. 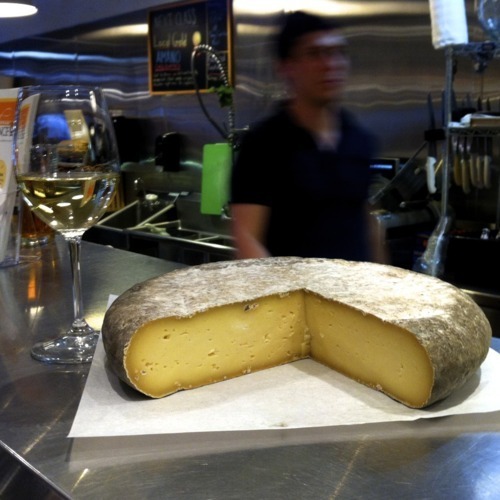 And speaking of raw, Lark’s Meadow only produces raw milk cheeses, meaning no pasteurization of milk takes place. 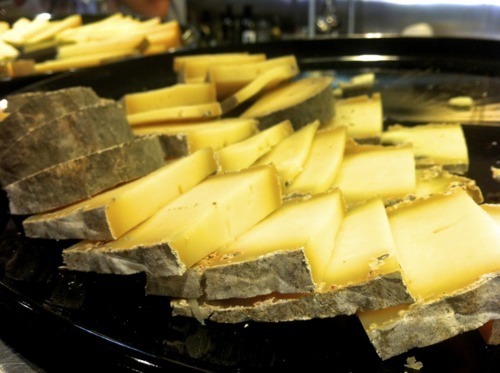 Instead of pasteurization, in order to ensure that the cheese is safe to eat, a minimum amount of aging must occur for the cheese to meet government safety standards. 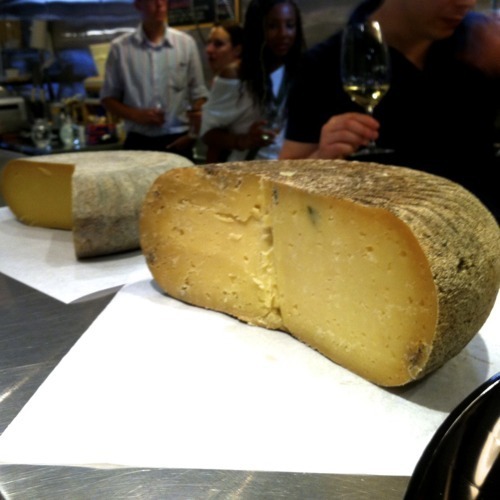 Many cheesemakers (and cheese aficionados) swear by unpasteurized cheeses, insisting that the taste is purer and truer to history. Kendall certainly has an interesting history in the cheese business. His only formal training consisted of a two-week internship. 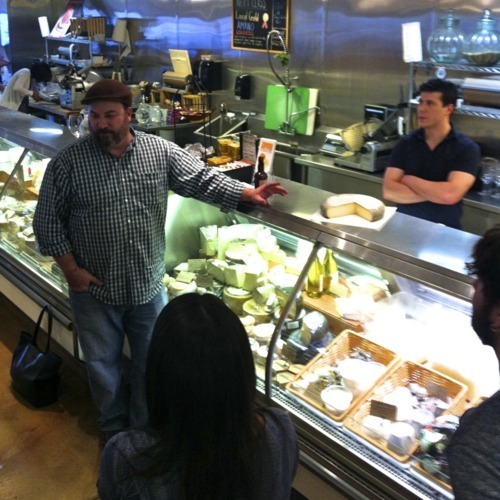 Other than that, he has self-taught cheesemaking, which is a pretty formidable task (and costly–Kendall told us that he had to throw away about $40,000 in bad cheese as a result of early mistakes). According to Kendall, the act of making cheese isn’t a very difficult process, but understanding the nuances that go into making cheese, such as understanding differences in how milk tastes, aging temperatures, and humidity really is more art than science. One small tweak in any of these variables can have a significant impact on the final product. We tasted three cheeses at the event. The first cheese is called Leland. It is a half sheeps’ milk, half cow milk cheese. Their cows are Brown Swiss, which are known for producing high fat content milk. It definitely shows in this deliciously creamy, high moisture content cheese. This one would be perfect for a decadent grilled cheese sandwich. The second cheese we tried is called Helen, named after one of Kendall’s mentors. This cheese is made with 100% cow milk. It has some strong grassy notes to it, and has a distinct yellow coloration. Kendall mentioned that milk that comes from cows who graze in a pasture has a slight yellow tinge to it, due to the beta carotene that the cows consume in the pasture. 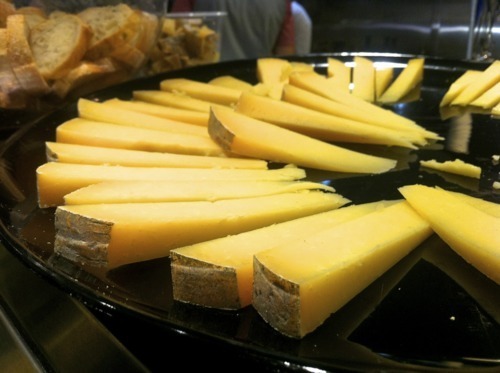 Many cheesemakers add coloring to try to duplicate this orange-yellow coloration in their cheeses. The third cheese is Lark’s very first production cheese recipe, and I have to say, they nailed this one. While the other two cheeses were delicious, the Dulcinea knocked my socks off. This cheese is a very low moisture cheese. This rich cheese was nicely salty and nutty, and it even reminded me a bit of the sharpness you get with Pecorino, except much more rounded and subtle. The other really neat thing about this cheese is that as you eat a piece of this cheese and work towards the rind, the flavor profile changes dramatically to a much nuttier flavor. All of Lark’s cheese is hand-produced, which, as Kendall said, means that he takes a lot of Ibuprofin since it is so labor intensive. Hand-pressing cheese results in some of the whey being trapped in the cheese, whose lactose then ferments into esters. It is these esters which give their cheeses some fruity notes that you won’t find in many other cheeses, contributing to make Lark’s cheese some of the most unique cheese out there. Lark’s Meadow Farms cheese are currently available at Caputo’s Market and Liberty Heights Fresh, and they will be carried at many Harmon’s stores in short time.